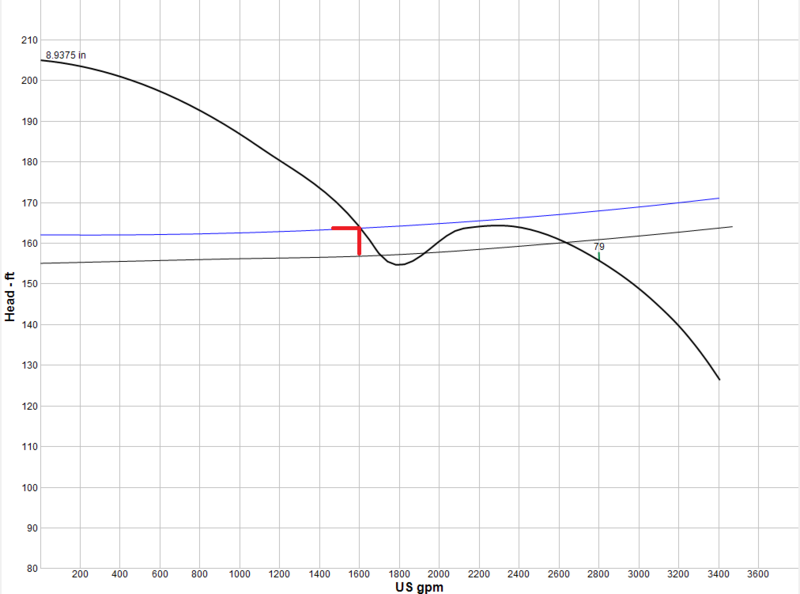 These pump curves can be easily understood when seen on a graph. I explained in two earlier columns how centrifugal pumps, specifically vertical turbine pumps, converted mechanical energy into hydraulic energy via the pump’s application of rotodynamic force to a fluid, in this case water. This applied force or energy is quantitatively expressed in the pump’s head-capacity (H-Q) curve. This curve graphically expresses how much flow (Q) can be generated due to the increased head (H) (pressure), which is added to the fluid by the pump. Flow occurs as the fluid “moves” from a state of higher potential energy (head) to lower potential energy (head). Conversely, the opposition to flow created by the pump’s increased head/pressure is measured and expressed as the system-head curve. The system-head curve reflects how much static head must be overcome, how much pressure is required by the application equipment, and any friction head losses in the delivery piping/system. It is these three system-head components (discussed in the February 2016 and May 2016 issues of Water Well Journal) which serve as the opposing pressure to the head generated by the pump. This is why the pump operates at the intersection of these two curves. Given the physical properties of how centrifugal pumps operate as described above, pumping results are not always intuitive. However, they can be easily understood when viewed graphically as the intersection of the head-capacity (H-Q) curve and the system-head curve. As we continue our discussion, let’s look at some curve characteristics unique to high and low specific speed designs and how system operating parameters can be impacted by these properties. We have discussed different pump models designed to provide continuous hydraulic coverage within a selected physical size by altering the impeller/bowl geometry for desired flow requirements. These models are identified by their specific speed designation. While a continuous range of flows can be achieved by changing the specific speed design within a selected size, the designs are limited at the upper, high flow/low head, high specific speed design and lower, low flow/high head, low specific speed designs. These limits exist from a practical standpoint in that at a certain point it is reasonable to go to the next size larger or smaller bowl assembly (pump), and from a hydraulic design standpoint due to the characteristic steepness or flatness of the resulting H-Q curves as we approach their respective upper and lower specific speed design limits. 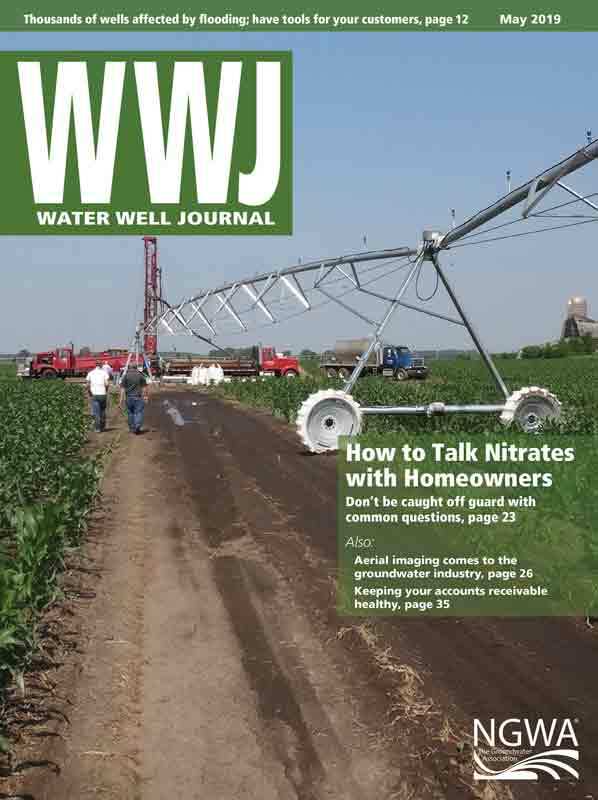 In the May 2016 column, we looked at advantages and disadvantages of both steeper head-capacity curves (higher specific speed pumps), and flatter head-capacity curves (lower specific speed pumps), depending on the application. Regardless, up to this point we have only considered H-Q curves that continuously rise from runout (at the right end of the curve), to shutoff (at the left end of the curve). These curves that continuously rise are considered “stable.” Head-capacity curves not rising continuously from runout to shutoff are considered “unstable” and will be the subject of our discussion going forward. Unstable curves are characterized as such because their head-capacity curve does not continuously rise from runout to shutoff, causing the system-head curve to potentially have more than one intersection point. See Figure 1 and note the three intersections of the H-Q curve and the system-head curve. This is not a preferred situation for single pump applications and should be avoided at all costs in multiple pump applications where the pumps are operated in parallel. Unstable head-capacity curves can occur with both low specific speeds (low flow/high head) designs and high flow (high flow/low head) designs described below. In low specific speed pump designs, the head-capacity curve becomes so flat that back near shutoff on the left side of the curve there will actually be a hump with a lower head at shutoff than at low flow conditions. This can cause unstable pump operation during startup and shutdown operations (depending on procedures), and unstable pump operation at very low flow conditions. Pumps should generally only operate momentarily at this point on the curve such as during startup and/or shutdown. 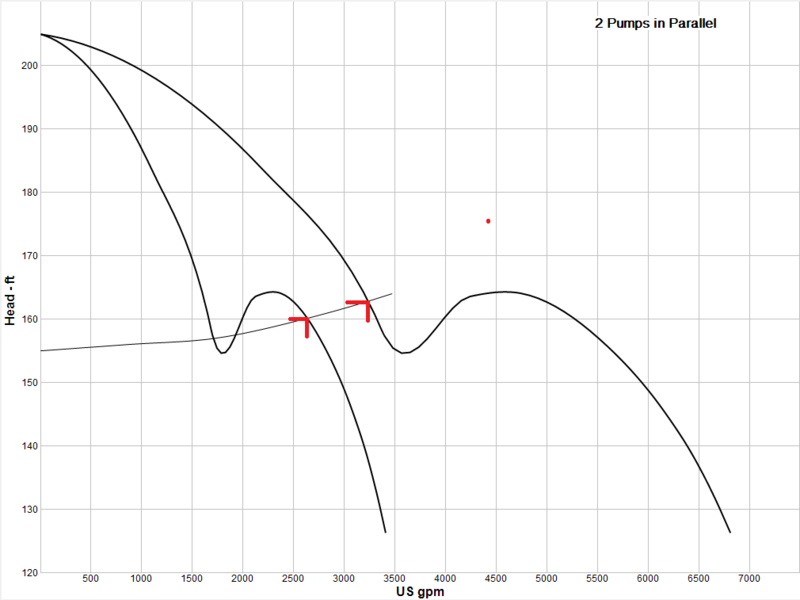 In high specific speed pump designs, the head-capacity curve is not only characteristically steep, but can develop a dip in the curve back between best efficiency point (BEP) and shutoff. In some cases the dip may be subtle, but even in the absence of a pronounced dip there will be an extended flat spot on the curve, making flow erratic over a significant portion of the performance curve. A number of system problems can occur with an unstable head-capacity curve. These can be influenced by startup procedure, subtle changes to resistance in system-head curve, or when multiple pumps are used in parallel operation as mentioned earlier. We will discuss startup procedures first. When a pump is started up with an open valve, there is initially little system-head pressure acting in opposition to the pump head-capacity curve. Given the lower system head, the intersection of the H-Q curve with the system-head curve is out towards the right end of the H-Q curve at or near runout. As the system fills and pressure builds in the system, the intersection moves back on the curve until they intersect at the desired design point. For our purposes, we will use the example of 2600 GPM at 160 feet (Figure 2). Now using the same pump and design point, but starting the pump against a closed valve, the pump’s initial system resistance is infinite. Because the valve is closed, there is zero flow until the valve slowly opens. Many systems operate this way to eliminate water hammer in the piping system. 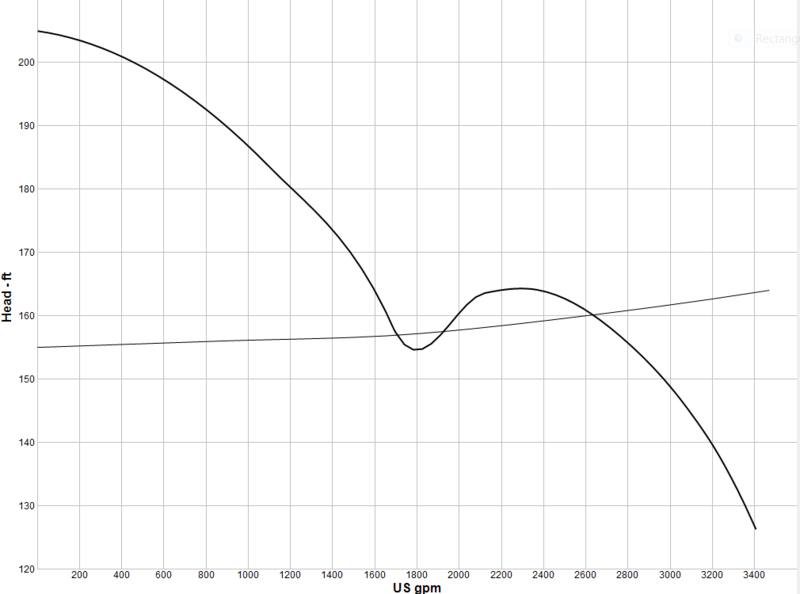 intersection happens at just more than 1700 GPM (Figure 3), not the desired 2600 GPM. The difference is the starting sequence causes the pump to initially start up at the opposite end of the head-capacity curve. This is the result of having the H-Q curve and system-head curve intersect at more than one point. Whether the instability in a pump head-capacity curve is highly pronounced, as in our example, or merely an extended flat spot in the curve, its effects on the stability of flow at the intersection of the two curves can be dramatic. In Figure 4, the system-head curve is raised a mere 7 feet. This additional 7 feet in system-head resistance causes the flow to drop an unacceptable 1000 GPM (Figure 4). In a recent real-world example, an end user had two identical high specific speed pumps with characteristic extended flat areas in their H-Q curve. They were operating practically right at the top of the “hump” at the leading edge of the extended flat area. Unit 1 was operating fine, but the second unit was producing more than 300 GPM less than both the required specification and the other unit. The end user was certain there was a pump problem with Unit 2, which was not the case. The difference in performance was due to a small change in the resistance in the piping (friction head loss) of the common header into which the pumps were discharging. The properly performing pump discharged into a straight run of pipe and the pump that was “underperforming” was discharging into a 90° elbow before joining the common header. It was this small change to the system head due to the added friction loss in the elbow that caused the discrepancy in the performance of the two pumps. The remedy was simply to raise the water level in the sump by 1 foot, which lowered the system head for both units, moving them away from the flat area of their H-Q curve. As both pumps were now operating at a steeper area of the curve, the small change in system head between the two units became negligible and their performance was approximately equal. When multiple pumps are operated in parallel, their flows are additive while the head each pump develops is not. Each pump “sees” the common system-head pressure at their respective discharge flanges. As additional pumps are added into the system, one might expect the total flow would double with two pumps, triple with three pumps, etc. This would be true if the system-head curve were flat. In actuality, system-head curves are rarely flat; they rise as flow increases due to the increased friction head losses in the piping system. 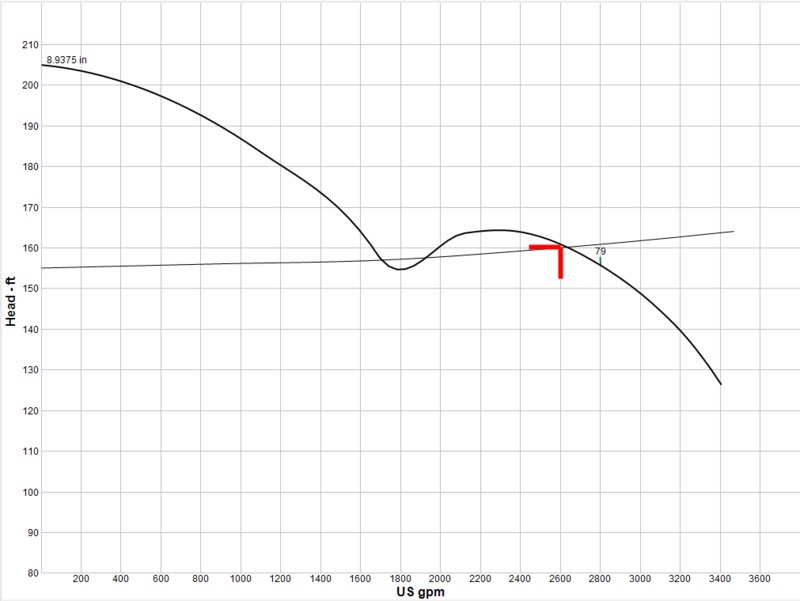 This increase in the system-head curve moves the point at which it intersects with the pump H-Q curve back to a higher head, lower flow point which is why the original flow does not quite double with the addition of a second pump. Regardless of the flow not quite doubling, it is reasonable to expect the increase in flow would be somewhat close, approximately 180%-190% depending on H-Q and system-head curves. The problem with an unstable H-Q curve is clearly illustrated in Figure 5. In this case, the addition of a second pump adds only another 650 GPM to the original flow of 2600 GPM. A lack of understanding of the interaction between pump H-Q curves and system-head curves would lead someone to believe the second pump is not performing to specification when it fact it is doing so. The special challenges presented by high and low specific speed designs, including unstable curves, needs to be clearly understood. This discussion is not intended discourage their use as their designs are meant to satisfy applications for which they have been specifically engineered. The intent here is to continue to demonstrate the importance of having a clear understanding of the relationship between head-capacity curves and system-head curves. 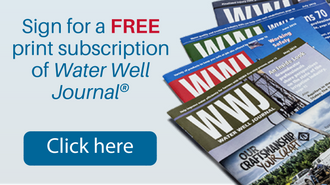 To help meet your professional needs, this article covers skills and competencies found in DACUM charts for drillers and pump installers. PI refers to the pumps chart. The letter and number immediately following is the skill on the chart covered by the article. This article covers: PIA-3, PIA-4, PIC-1, PIC-5, PIF-6.